A new study finds that businesses in the service industry may be grappling with the same internal issue across the board: scheduling hourly employees. WorkJam, a company specializing in employee relationship management tools, is announcing the results of a new survey that shows retailers are suffering, often at their own hand. 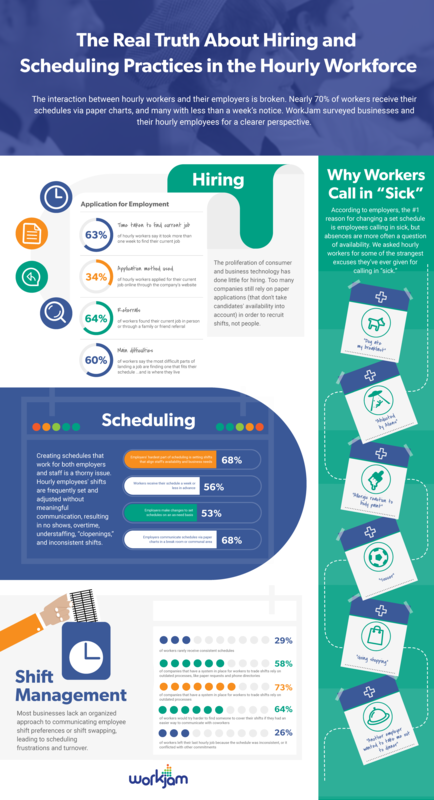 Poor scheduling practices often leaves them understaffed and with an exceptionally high turnover rate amongst employees due to inconsistent hours. According to the survey, almost half of the retailer respondents (46 per cent) admitted they were frequently or sometimes understaffed, with 53 per cent of them saying this compromised their level of customer service. So it’s no surprise that these “on-call” type hours that result from last-minute schedule creation has helped lead to high worker turnover, which also costs these businesses a fair chunk of change. The study shows that more than a third of retailers experienced a quarterly turnover rate of 26 per cent for hourly workers, with another 33 per cent of respondents said that this number had noticeably increased in the last two years. And all this change in their workforce and lack of institutional knowledge can really hurts business’ bottom line. One report from the Institute for Research on Labor and Employment estimates that the costs of replacing a worker can be substantial — they average is about $4,000 overall and can be as high as $7,000 for highly skilled information sector positions. So, what’s the solution? Ostrega suggests that in addition to investing in an enterprise-level schedule creation tool such as WorkJam, Kronos or Empower, he recommends boosting employee engagement above all else. Retailers should have a conversation with candidates on availability during the recruitment and hiring process in order to make good hires and start off that relationship on the right foot. Find a way to recognize employees. Businesses can put processes in place to motivate and reward workers for doing good work. The Montreal-based firm recently commissioned the survey to study trends in scheduling hourly employees amongst retailers and service-oriented industries. The study compiled the experiences of 500 service managers as well as more than 700 hourly employees.